I started collecting postcards in 2006 and then for some reason I stopped. When I moved to Afghanistan, I left all my collections in Dubai hoping that I’ll be able to come back to fetch them. Unfortunately, I was not able to come back in Dubai so I thought I already lost all of my collections. Luckily, my ex-housemate kept all of them and after over 2 years, I finally got them back. Every week, I will be sharing all my postcard collections via this blog. I hope you will all like it. Here’s the first one I got from Hungary. Do you want to swap a postcard with me? Please drop me an email with complete name and address and I’ll send you a postcard from the Philippines. cool! another postcrosser! 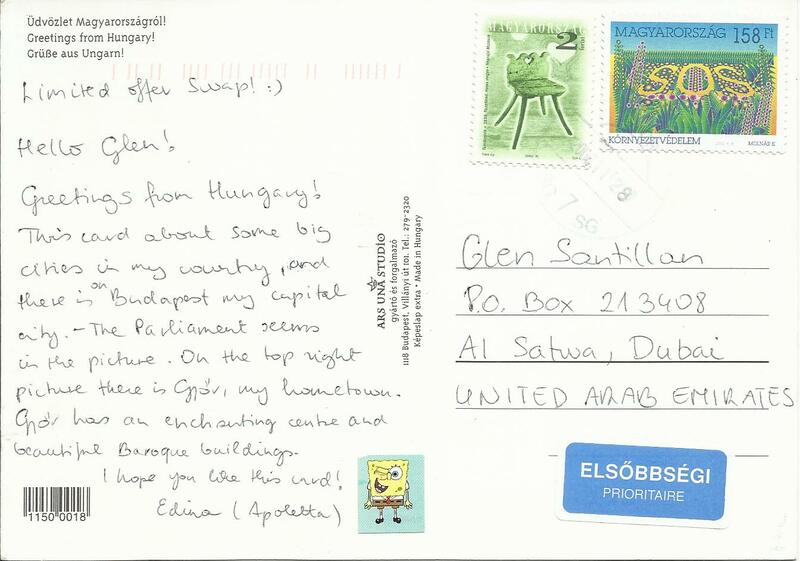 that Hungary postcard is really nice! I hope we can swap postcards + maybe you can also join our Philippine postcrossing group on Facebook! That's a great hobby and it's nice that you are sharing this tidbits of info about Hungary and different places here. Postcard collecting is so cool! And this one is really nice. A cousin of mine swaps ATCs (Artist Trading Cards), and she gets them from every part of the world. 🙂 Could be a great way to get to know more friends, too. I will be looking forward to more of your series of post card posts. I was once a collector of post card, but when computerization started to boom where images from around the world and different places are easily searched, that's when I stopped.